Ryan and Lisette explore each other and the lifestyle, but what started out as playtime quickly evolves into something more. The problem? Ryan isn’t ready to get serious again and Lisette doesn’t want to fall in love with a guy who can’t give all of himself to her. Both of them are going to have to break out of the bonds holding them back from happiness. Interest is piqued, right? So why not head on out and Buy It Now? Hear ye, hear ye! All new PG Forte book, out now! Caleb is a bionic soldier with little-to-no memory of his past. He's seeking the truth about himself and those missing memories. Aldo's an undercover cop who just might have the answers to Caleb's questions. But if Caleb's the man Aldo thinks he is, how can he let him get away a second time? Then there's Sally; she's an ER physician who used to be married to Aldo's late partner, Davis. Sally's not dealing with widowhood very well. In fact, it's getting harder, every day, just to find a reason to keep getting out of bed. If the truth about the men's shared past comes to light, she could lose them both. Along with her last, best reason to go on living. This holiday season, chance will bring them together and give them an opportunity to help one another find what they each want most. But every gift comes with a price. And keeping what they've found once they've found it? Yeah, that's gonna be the hard part. Sounds fabulous! Can't wait to run out and Buy It Now! So, remember that reunion trilogy I've been working on lately? I just got the first cover. Most Likely To Succeed will be available from Carina Press in March 2013. You guys! I'm so excited! The co-owner of my favorite winery, Kim Roberts, is now a mystery author! In Luna Sea the natural beauty of Maui, along with the realities of island life reveals a different Paradise than that seen by most visitors. While surfing off Maui, Hawaii’s famed Valley Isle, the new Lahaina harbormaster Aloha Jones finds herself in dangerous seas. What Jones initially thought was going to be the rescue of a snorkeler hit by a catamaran turns out to be the recovery of the body of water taxi owner and harbor troublemaker Dan Colley. Her Coast Guard law enforcement background makes her question if the death a tragic accident or a premeditated murder. Aloha’s boss with the Hawaii State Harbors Division, Max Yake, and his sidekick, Marine Enforcement Officer Gil Mangas, conclude it’s an accident. 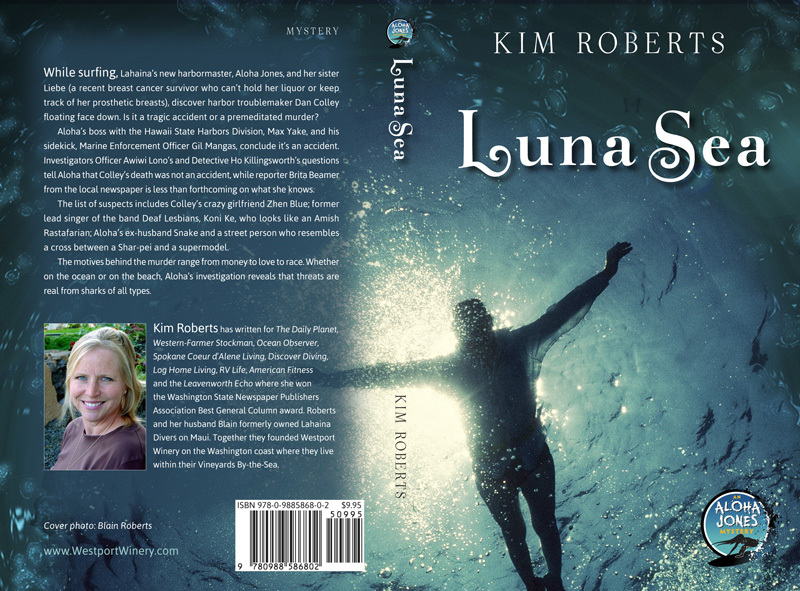 Investigators Officer Awiwi Lono’s and Detective Ho Killingsworth’s questions reveal something else, while reporter Brita Beamer from the local newspaper is less than forthcoming on what she knows. In the process Aloha finds no lack of suspects—not to mention a whole raft of motives—as she gets to know Colley’s crazy girlfriend Zhen Blue and her daughter, Momi; former lead singer of the band Deaf Lesbians, Koni Ke, who looks like an Amish Rastafarian; Aloha’s ex-husband Snake; and a street person who resembles a cross between a Shar-pei and a supermodel. Possible motives behind the murder range from money to love to race. As Aloha wades through information to find the truth, in the ocean and on the beach, she faces real threats from sharks of all type.